THis adorable set of shakers will be such a sweet addition to your Thanksgiving decor! Made by Hallmark Inc, and made of hard plastic. 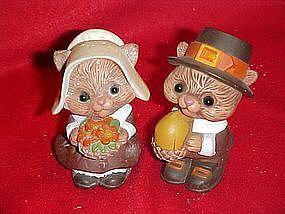 Very detailed little chipmunk couple dressed as pilgrims measure 2 3/4" tall. She holds a basket of flowers and he holds a big acorn. Stoppers intact and in wonderful condition.